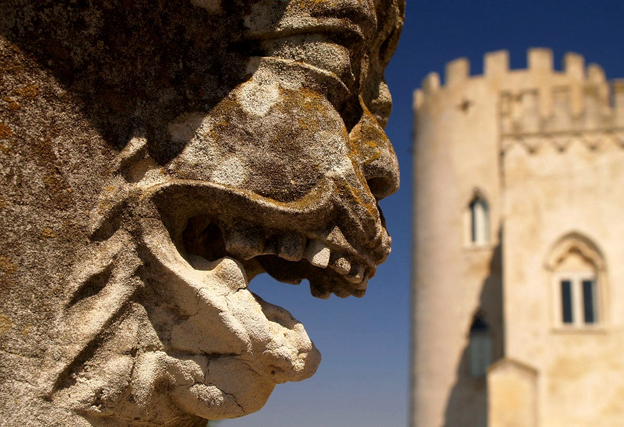 I can recommend no better day out in the Province of Ragusa than a visit to the Castello di Donnafugata. Those among you who love the Commissario Montalbano TV series, the on screen adaptation of Andrea Camilleri’s detective novels, will recognise the building. 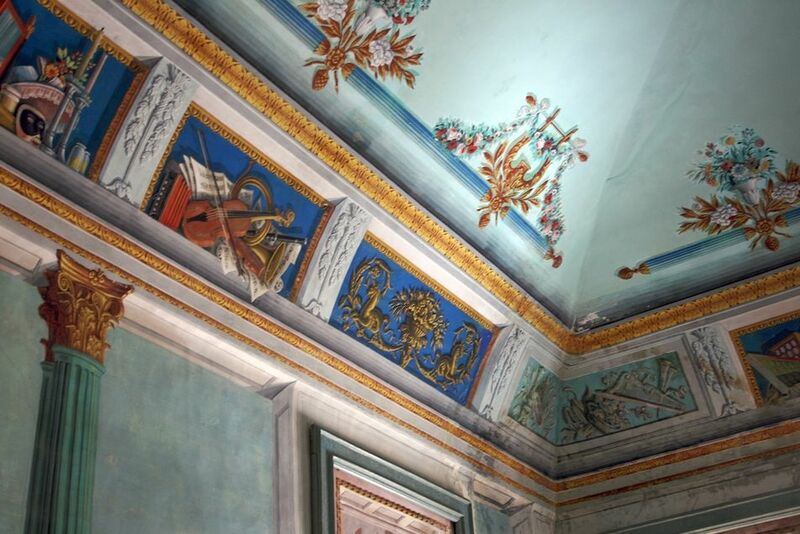 It is featured in some episodes of the series as the villa of Mafia boss Balduccio Sinagra. Recently fully restored, the Castle, with its white façade and Venetian Gothic loggia, gives me a warm feeling of pleasure every time I see it, perhaps because it is a castle that could have illustrated a book of fairy tales and there is an immediate sense of recognition. Disappointingly, though, the Castle's name, whose literal translation would be "the woman who fled", is just the result of a linguistic corruption and not a reference to any romantic escape. In the tenth or eleventh century, the Arabs, finding a fresh water fountain on the site, built a fortification there and named it "Ayn As Jafat" ["Fountain of health"]. This became "Ronnafuata" in dialect and later "Donnafugata." There are, however, some romantics who insist that the Castle derives its name from the imprisonment there of Queen Blanche of Navarre in the fifteenth century. Her husband, King Martin I of Sicily, had died in 1410 and she was courted by Bernardo Cabrera, an elderly nobleman who hoped to marry her and become king. When she refused him, the story goes, he locked her up in the Castle but, with the help of a servant, she managed to escape. I, too, would like to believe this tale, but the Castle was built later, its oldest part being the seventeenth century square tower. Another illusion held by some visitors is that the Castle is the Donnafugata mentioned in “The Leopard” - there are even some guide books and websites which tell you that this is so – but it is not. Nevertheless, when I am there I like to imagine the ladies of the Prince of Salina's household living in such surroundings and, if I listen carefully, I am sure I can hear the swish of their crinoline skirts upon the floors. The Castle that we see today is largely due to the work and imagination of the nineteenth century politician Baron Corrado Arezzo de Spuches [1824-95] and, with its mixture of architectural and landscaping styles, it is a fine example of that era's eclecticism. I think Corrado must have been rather a jolly baron. Baron Corrado built Neo-Gothic and Neoclassical structures onto the existing seventeenth century framework and he delighted in the mixture of styles, adding the famous trefoil arches to the loggia. He had a coffee house built in the grounds along with a temple, artificial caves and mazes. He also purchased exotic plants whose descendants can be seen alongside Mediterranean species in the gardens today. Here a visitor could happily spend several hours, for there is always a new “surprise” to see as you wander through the grounds: if you venture as far as the entrance of a small chapel, a statue of a bearded monk will try to hug you! 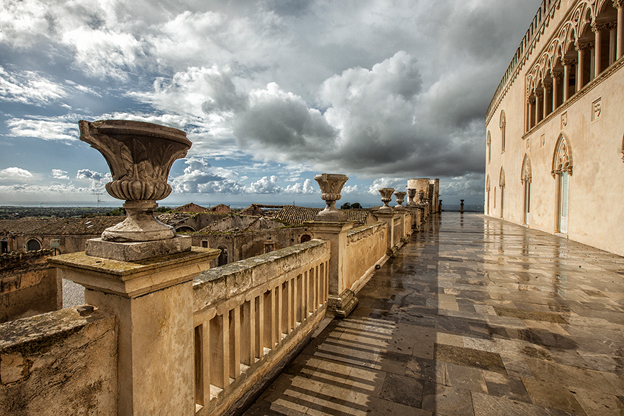 Inside the Castle, which has 122 rooms, only the first floor is open to visitors, but there is plenty to fascinate: you reach the “piano nobile” via a black stone staircase with statues on either side and when you enter the first room, you begin to understand the attention to detail that the Sicilian nobility of Corrado's time lavished upon their country homes: the wallpapers are hand painted and, in the “salone degli stemmi” (heraldic room), the coats of arms of various noble Sicilian families are depicted. Then there is the “smoking room”, which has a wallpaper with pipe motifs. If the men had a smoking room, the women were not to be outdone and in the “sala delle donne” (women's room), where they passed the evenings, there is an enormous chandelier in Murano glass, a gift from one of the Baron's many important visitors. There is also a music room with three mechanical pianos, a billiard room, a picture gallery and the bedroom where Queen Blanche is said to have spent her captivity. There was no fleeing woman but there was, at least, an elopement so that is some compensation: this happened when a Frenchman named Gaetano Combes de Lestrade fell in love with Clementina, Baron Corrado's granddaughter. The two ran away together and Corrado did everything he could to find them. He succeeded, the families resolved their differences and afterwards the couple lived for part of each year in Sicily and the other part in Paris. Their grandson, another Gaetano, was the last owner of Donnafugata before it passed to the Province of Ragusa in 1982.